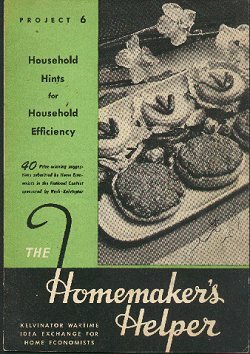 (69) PAMPHLET: The Homemaker's Helper - WWII-Condition: Very Good- All pages intact,no tears. Some yellowing.- Kelvinator Wartime Idea Exchange for Home Economists Project 6. Date: 1940-45. Includes "Household Hints for Household Efficiency." and ads for a "new electric refridgerator." Price: $6.00 + shipping.